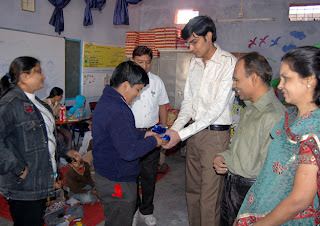 Prateek Gagrani, a youth icon & one of the employees of www.viewbestads.com decided to celebrate his bday on 14th Dec 2010 among the special children of SNEH. His parents Mr Sanjay Gagrani & Mrs Sandhya Gagrani along with his family friends and many members of Maheshwari Samaj were present on the occasion. They distributed sweets and toffees to the kids. He also took the 3 yrs membership of "One Rs per Day- Lets Care with SNEH" Scheme. Mr Govind Mohta, Ghanshaym Rathi, Rajesh Dhakad, Rajendra Goydani, Raju Maheshwari were present. SNEH's Student Master Shivam Tiwari presented a memento to Prateek. Its a really good initiative...hats off to all the members of this groups..you people are making us proud..Serving to people is the serving to GOD. It's a good idea from "www.viewbestads.com"
that site will also give chance for donate that user. I am giving the promise that i will also donate whole amount (approved from the viewbestads.com) to this.